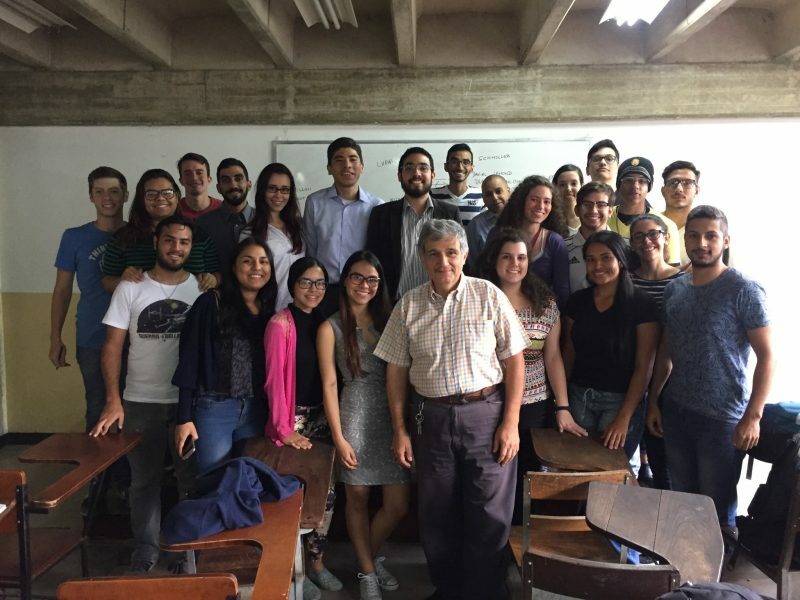 Recently on Twitter Dr. Lahoud posted a very beautiful picture of himself and his Austrian Economics students. That picture originated the interview that follows. It is a small token of appreciation to a heroic scholar who is promoting the ideas of the Austrian School of Economics in one of the harshest environments. And he is doing it both effectively and courageously. Since 2008 with the deepening of the socialist model in Venezuela, I decided to offer and Introduction to the Austrian School of Economicsas an elective subject both at the Universidad Católica Andrés Bello (UCAB) and at the Universidad Central de Venezuela (UCV). DL – It is worth mentioning that the UCAB is originally a Keynesian university and the UCV since the mid-twentieth century has been a Marxist university, and although the core of the curriculum has that ideology, the trend towards Keynesian thinking is growing more and more. The most curious thing is that at UCAB, which is private, the subject is offered every semester, but it is hold sporadically. While at UCV, which is a university supported by public money, the subject is held every semester. Students are more motivated, it seems. In History of Economic Thought at UCAB, I also emphasize on the theory of value. The subject is taught during the 6thsemester but for the students is usually the first time they are introduced to this notion. My course ranges from the Scholastics to 20th Century authors, so I touch topics related to the Austrian School of Economics, and use for example Murray Rothbard’s and Mark Skoussen’s books. DL – With the Centro de Divulgación del Conomicimiento Económico para la Libertad (CEDICE) I regularly teach seminars for journalists and give lectures for those interested in subjects of the Austrian economics. Moreover, this year they are developing a diploma course that includes lessons in Austrian Economics, too. The Mises Venezuela organizes a celebration every year about Mises’ thought in September and they always invite me, so I give a talk about some aspect of Mises and Praxeology. FF – How is it like to promote libertarian ideas in Venezuela? Since then, we have had civilian governments elected, dictatorships by coup d’etat,and dictatorships by election. In any case, all of them have always been governments with an ideology of economic intervention, therefore socialist. Many Venezuelans are fed up with all these interventionism/socialism. For that reason today it is very easy to talk about freedom in my classes and in some public places. DL – In Venezuela there is no Austrian tradition. There have been people with a liberal vocation. Perhaps the first Austrian was Henrique Pérez Dupuy (1881-1974), who was also a member of the Mont Pelerin Society. He wrote many articles in which he disseminated Austrian ideas. But he was a lonely banker who was not given much attention. Today, it is still a matter of individuals. I could mention Oscar Torrealba, Willians Ruiz, Guillermo Rodríguez, Rafael Avila, Hugo Bravo, and myself, of course. We are -in a very disperse manner- trying to spread Austrian School of Economics in Venezuela. DL – That is a long story. I graduated as an economist in 1987 and was trained as a Keynesian. What is more, my first job away outside my family business (my dad was an entrepreneur and technically my first boss) was in the Central Bank. I was even a supporter of a social democratic party (called Acción Democrática). In the beginning of the 21stcentury, I found the Mises Institute website. There was a Test called How Austrian Are You?I took the test and the answer I received by mail was fabulous. According to Mises Institute I was 96% Austrian and 4% Monetarist. I was not Keynesian anymore and I finally understood why I had such a problematic relationship with my colleagues at the university. DL – I feel like Mises in socialist Vienna (after the Great War and) before Nazism. I have known the reality of the failure of socialism in my own flesh. And as I live in Venezuela, I want to show that this is an absolute failure always and everywhere. Socialism, whatever form may take, only brings economic destruction and worsening of the conditions of humans life. The Austrian School is the school of economic thought with the most explanatory power.That is why I have come to the awareness that I am a tropical Austrian. DL – Latin America as a whole is victim the same disease as Venezuela. Venezuela has the most bloated state and public sector, that is why is the one who suffers the most. But this should be a lesson for the rest of the Latin American countries. Before 1973 our government did not own any companies and Venezuela grew 6.5 per cent year-on-year. In contrast, between 1974 and 1998 we experimented with democratic socialism and brought GDP growth to 1.9 per cent year-on-year. Since 1999 we are experimenting with scientific socialism and the rhythm is 0.0 per cent or negative. DL – Venezuela is on the contrary path to Austrian ideas and the result is atrocious. We seem to have forgotten that, between 1940 and 1973, with a partially private central bank which did not have an active monetary policy, an oil industry in the hands of transnational corporations that exploited the resource and paid taxes and royalties, a relatively small size government government, and fiscal discipline the result was that growth of 6.5% year-on-year that I indicated before.